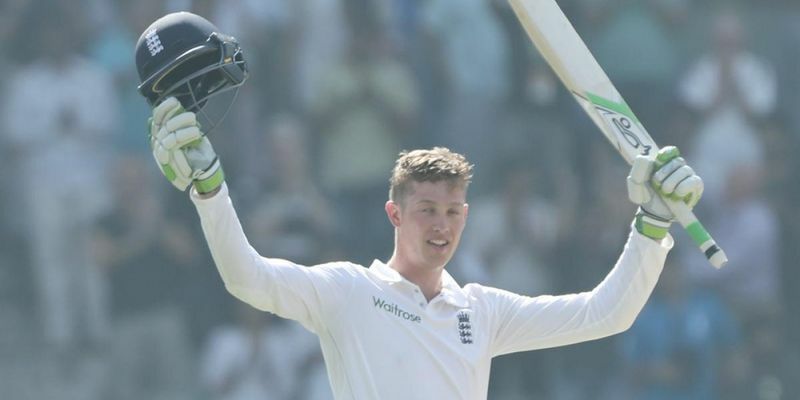 England took full control on the first Day of the 4th Test in Mumbai thanks to a brilliant century on debut by Keaton Jennings as the visitors finished the day at 288/5. R Ashwin led the Indian fightback towards the end claiming four wickets, three of which came in the last session. England won the toss for the third time in the series and, unsurprisingly, elected to bat first with Alastair Cook joined by Keaton Jennings at the crease. England got off to a slow start as the Indian bowlers showed the form that had seen them win the match for their team before the mini break. India had a great chance to put England under some serious pressure when debutant Keaton Jennings edged an Umesh Yadav delivery to gully. Karun Nair stretched every muscle in his body but was not able to hold on to the ball. A couple of overs later, Bhuvneshwar Kumar caught the Englishman in front of the stumps on his pads, but the Umpire sided with Jennings on the decision. India reviewed the decision and it took just a replay to see that the ball had hit Jennings outside the off stump. After the review, England were very selective in their shot selection and managed just 29 runs off their first ten overs. After seeing off the early Indian charge, England started scoring more freely as they added another 42 runs in the next ten overs. Following the lack of wickets, Virat Kohli turned to his spinners in the hopes of a breakthrough, but England looked ready for anything that the Indians could throw at them as Jennings reached his maiden Test fifty in his very first international innings. Cook smashed R Ashwin for two back-to-back boundaries in the same over. However, four overs before lunch, India finally got a foothold in the game as Jadeja sent Cook packing off his third ball after some good work by Parthiv Patel behind the stumps. England ended the session with a score of 117/1 after 31 overs. England continued to look solid after the break as they took no risks, but kept the run flow going by rotating the strike with ease. Patel had another chance at a stumping but the keeper misjudged the bounce of the ball, and Root stayed put. Virat Kohli made up for the error in the very next over as he took a sharp catch in the slips to send Root to the pavilion at a mere score of 21. With the pitch beginning to spin, India started to ask some serious questions of the English batsman, who responded brilliantly by not giving the home side a sniff of their wicket. Moeen Ali, who had come to the crease to replace Root, started gingerly reaching double digits off 32 balls. Jennings, on the other hand, was playing like a seasoned professional putting the bad balls away whenever he got the chance. When the 24-year-old entered his 90s an inconspicuous incident occurred on the field. Bhuvneshwar Kumar threw the ball back from deep square leg but the ball hit umpire Paul Reiffel at the back of the head. The game had to be stopped for the official to receive treatment. Eventually, he was taken to a hospital and third umpire Marais Erasmus had to replace him. Jennings went on to become the 19th Englishman to get to a maiden hundred as England went in for tea with the score at 196/2. After the interval, England came out swinging as Ali hit Jadeja for a four off the very first ball. A couple of overs later, Ali went two better as he cleared the fence for the first time in the Test. Scoring at a brisk pace, Ali brought up his fifty but that was as far as he could go as he tried to slog sweep Ashwin but ended up getting a top edge that Nair grasped easily. Two balls later Ashwin made sure India redeemed themselves as Jennings edged a ball to a deep gully again. This time, however, Pujara made no mistake as he took a low catch to bring an end to a magnificent first innings by the Englishman. The scoreboard read 230/4 with just under 20 overs left in the day. India used their second review, a ball before the referrals were refreshed, for a caught behind on Ben Stokes. The replays suggested that there was daylight between bat and ball and Stokes stayed put. Jonny Bairstow threw away his wicket as he tried to sweep Ashwin. Again, the ball took a top edge, and Umesh Yadav was more than happy to gobble it up at square leg. England ended, what could turn out to be the match-winning day, at the score of 288/5.